An upward planar drawing of a directed graph (digraph) is a planar drawing such that all the edges are represented by curves monotonically increasing in the vertical direction. In this paper we introduce and study the concept of quasi-upward planarity. Quasi-upward planarity allows us to extend the upward planarity theory to a large class of digraphs including digraphs that also have directed cycles. First, we characterize the digraphs that have a quasi-upward planar drawing. Second, we give a polynomial time algorithm for computing ``optimal'' quasi-upward planar drawings within a given planar embedding. 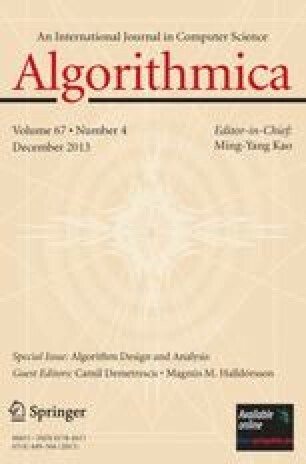 Further, we apply branch and bound techniques to the problem of computing optimal quasi-upward planar drawings, considering all possible planar embeddings. The paper also contains experimental results about the proposed techniques. Key words. Planarity, Upward, Flow techniques, Branch and bound.